So here we are, it’s finally fall. If you are living in New England you're starting to notice the changing leaves, the cooler nights, and your local farmer's market has shifted from tomatoes and corn, to apples and squash. Even the covers of popular cooking magazines are sporting some beautiful gourds. One Sunday while the BF was watching his beloved New York Giants, I decided to peruse the stacks of my local bookstore. I love visiting bookstores to browse food magazines. It's fun when you discover a new title. I picked up a copy of Fine Cooking magazine, and was a little miffed at the price.... but then I looked inside. As you might imagine, I subscribe to a good number of cooking magazines - Rafe's mom also has a pretty healthy collection of her own, with Cook's Illustrated, Gourmet (RIP), and Bon Apetit issues stemming as far back as 1999. As a result of all of these options, I feel like I've seen the same recipes over and over. Squash soup, roasted chicken, cupcakes galore, and a resurgence of beef bourguignon.... it goes on and on. But the October issue of Fine Cooking actually kind of wowed me. I immediately made this acorn squash with rosemary and brown sugar, which made a great mid-week side-dish. I was excited because it took very little time to cook, and I already had most of the ingredients in my pantry. I assembled the remaining ingredients. I hope Meghan doesn't turn up her nose at my Sutter Home pinot grigio! 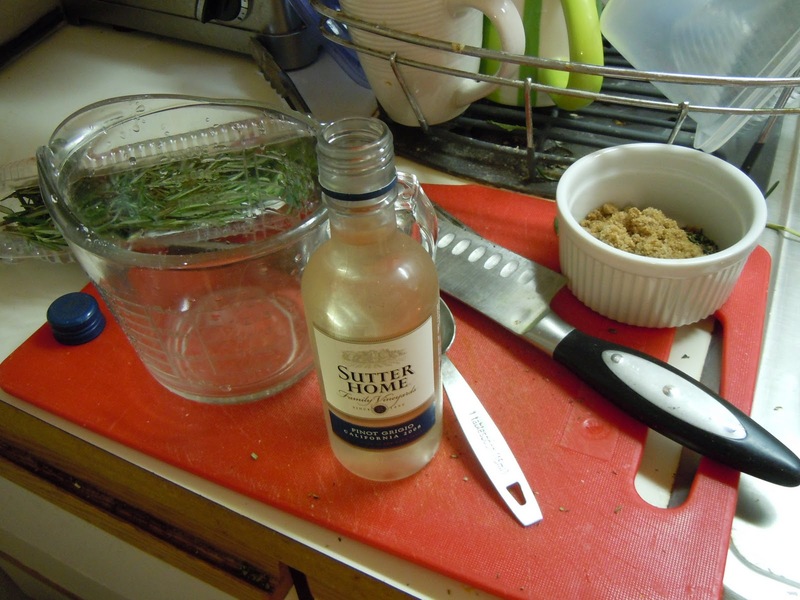 I'm not a big fan of drinking white wine, but I do love the flavor when cooking it, so I buy the little airplane-sized bottles at the grocery store. Each one is a little over a cup - so its pretty easy to use it up in only one or two recipes - and you won't find yourself throwing away any wine. Once the squash is browned on both sides you pour in the wine, brown sugar, rosemary, salt and pepper. Whoa, look at it bubble. Then you simmer it in a covered pan. 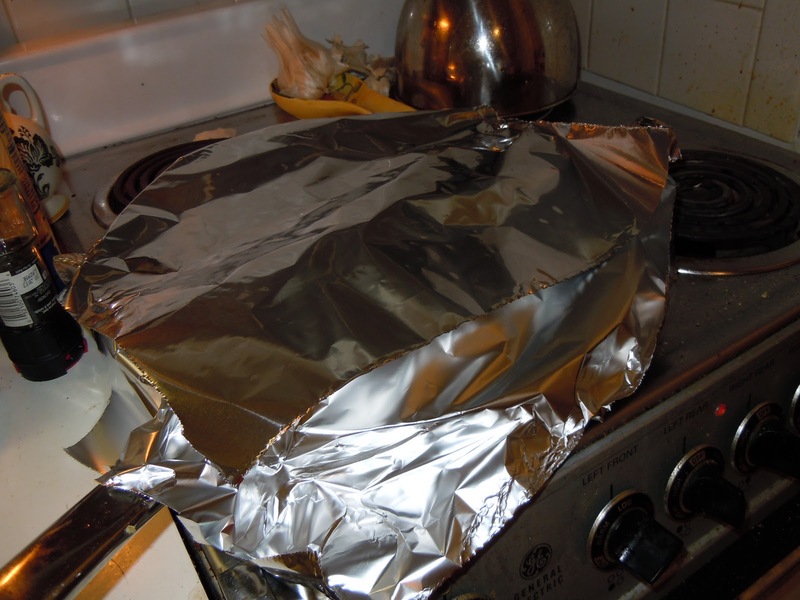 The instructions advised to use the largest pan you have, unfortunately my largest pan does not have a lid...so I improvised with aluminum foil. Classy, I know. Any wealthy readers who want to donate to my cookware collection just email me! During a 'tweet up' on twitter to discuss this issue of Fine Cooking, I expressed my interest in this recipe, but didn't know what I should pair it with. 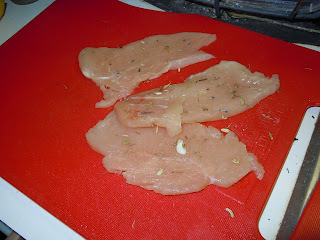 Someone suggested chicken paillards which sounded too fancy for a weeknight meal.....turns out, a paillard is just a chicken breast that has been pounded out with a meat mallet (thank you wikipedia!) So I pounded my paillards and seasoned them with salt and a little herbs de provence, and cooked them up in a separate pan. They cooked incredibly fast since they were so thin. This made a great weeknight fall meal - and had plenty of leftovers for lunch the next day. 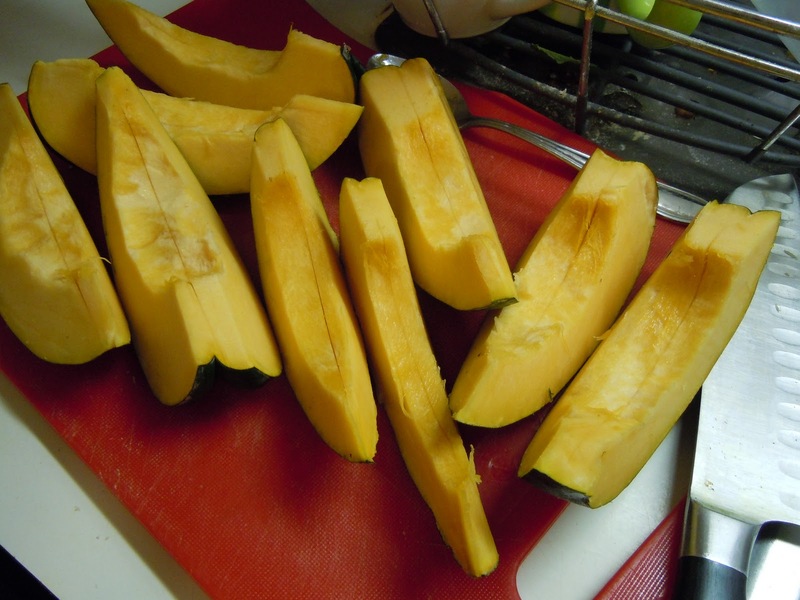 I love how this recipe highlights both the sweet and savory qualities of acorn squash. I really enjoyed this recipe - and I'm looking forward to some of the others in this issue of Fine Cooking. This looks like a perfect autumn meal! I've never heard of Fine Cooking but I try not to subscribe to too many magazines and look up recipes online (especially Epicurious) instead! 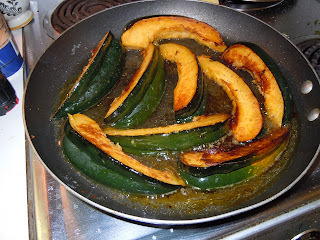 Yum I love acorn squash! Looks tasty. 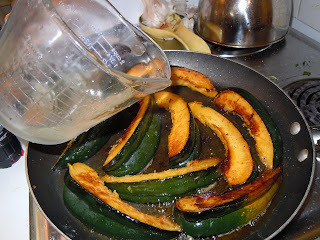 I have never done anything with squash besides roast it. I love this pan simmering idea! It looks so tasty. I subscribe to tons of magazines too and have way too many cookbooks around... but it's really good for stumbling upon recipes like this one. This looks great. I've only roasted an acorn squash. I never have leftovers though. I eat half and the bf eats half...is that bad? I'm a hog! aww Megan would never turn her nose at your Sutter Home ;) (funnny!) I ate a lot of acorn squash this past weekend. Your recipe looks great! My friend and I used to exchange magazines each month - my Bon Appetit for her Fine Cooking - and I loved it! Unfortunately she moved, but I need to subscribe! Looks like the perfect side dish! 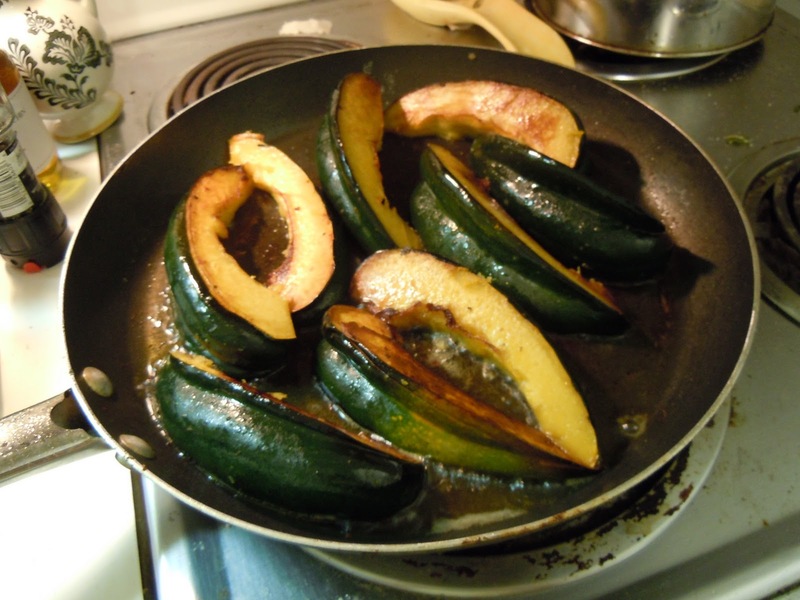 I'm so glad that you liked the acorn squash recipe, Alicia, and that you make the chicken paillards I suggested! Sorry I didn't say what paillard meant during the tweet-up - my bad! 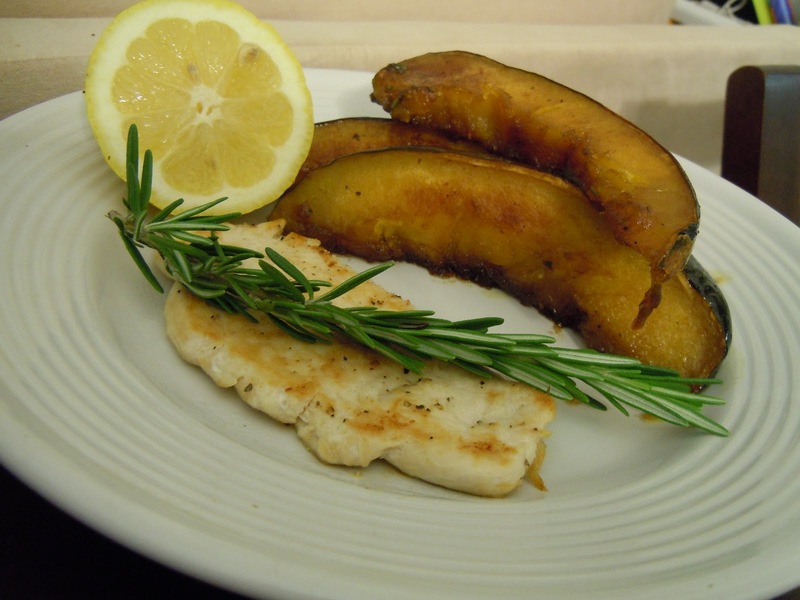 Looks beautiful and delicious, and I love that you don't have to peel the squash. Will definitely try this one!